Complete range of Heavy Duty and Standard Ergonomic PowerHandle Drivers. Available in Slotted, Phillips, PoziDriv, Torx, Nutdrivers, Insulated, Tamper Resistant TORX, , & Bit Holders. Bio-design handles will help increase torque while reducing negative impact on operators such as Repetitive Motion Disorders or Carpel Tunnel Syndrome. Blades are high alloy chrome-vanadium-molybdenum-steel, hardened, chrome-plated with black tip. The Industrial Standard For Daily Use. Heavy Duty & Round Blade, Slotted, Phillips, TORX, & 1/4" Bit Holder, Also System 6 Dynamic for Interchangeables. In all blade styles. Bio-design handles will help increase torque while reducing negative impact on operators such as Repetitive Motion Disorders or Carpel Tunnel Syndrome. Wiha offers a comprehensive range of TORX bits & Sockets as well as Slotted, Phillips, PoziDriv, Hex, & Square drive insert bits. Exact fit precision machined bits give longest tool life and highest productivity. Available in Insert Bits, Power Bits, Sockets and special production bit lengths. Item #79243 Assortment of Slotted, Phillips, & TORX Insert Bits with magnetic driver in pocket sized box. Item #38006 Assortment of Slotted & Phillips bits with shielded 1/4" Magnetic Bit holding driver. Item #28296 Assortment of Slotted, Phillips, TORX , Insert Bits with magnetic drive tool & Topra Ratchet Handle. Wiha High Durability Dead Blow Hammers Dead blow medium hard replaceable face hammer, recoilless, polyurethane tips, formed steel head & shaft. Preserves sensitive surfaces and edges. Tips polyurethane, yellow, cadmium free, shatterproof, high wear resistance. Tips replaceable, press fit available in 30, 35, 40, 45 & 50mm diameter. Steel head & handle, lacquered in blue, cushioned rubber handle grip, black. Blade is ceramic, anti-static, anti-magnetic, for tuning & adjusting. Free spin rotating finger cap for precise tuning control. Available in slotted, cross point & 3 piece set. Tapered Full Size Handle with molded on durability. Rotating cap for precise control and two handed power turning. Available in Slotted, Phillips, & Set. 100% Tested, Each tool individually tested to 10,000 volts. Blades of Wiha Exclusive CVM tool steel, hardened, black finish. Insulation & Handle molded directly onto blade. Certified up to 1000 Volt ac or up to 1500 Volt dc. Wiha Precision Tools Available in Slotted, Phillips, TORX, Hex, Ball Hex, PoziDriv, Nut Drivers, and Chip lifter . Over 140 tools, 30 sets in Inch &Metric sizes. Exact fit precision machined tips, hardened 58/60 RC Vapor Micron Chrome tips. Wiha Exclusive formula chrome-vanadium-molybdenum hardened tool steel blades. Molded on handles with tapered control Ergonomic design for user comfort. Wiha Handles are proportioned to tip size for precise torque to blade ratios. Precise Control & Smooth Turning with fitted free turning rotation cap. Available in sets, singles, carded or bulk, OEM custom labeled or molded colors. Pocket sized 2.0" x 2.0" x 1.0". C5 Permanent Ceramic Industrial Magnets. No batteries or electricity required. Box is high quality molded plastic, Impact resistant, cadmium free. Wood Handles feature Blade extending through handle, with striking plate. Blades are 1/4" diameter on round or square. Dead blow medium hard replaceable face hammer, recoilless, polyurethane tips, formed steel head & shaft. Tips replaceable, press fit available in 30, 35, 40, 45 &50mm diameter. Steel head &handle, lacquered in blue, cushioned rubber handle grip, black. Molded on handles cadmium free, shatterproof, chemical resistant. Blades are Wiha special chrome vanadium molybdenum hardened tool steel. Nickel plated for corrosion resistance, available in longer lengths. Handles Proportioned to Blade Size for Optimum Torque Performance. Molded on handles Square handles for easy gripping. The Most Ergonomic Design In T-Handles Available. Wiha Comfort Grip T-handles in Hex, Nut Drivers &TORX, T-Handle Magnetic Bit Holders, T-Handle Square Drives for Sockets &System 6 T-Handle for interchangeable blades. Precision machined for exact fit and longer tool life. 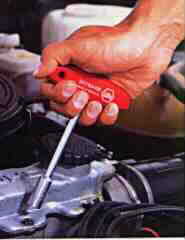 Wiha molded on Comfort T-handle achieves more comfort and higher torque values. Wiha Exclusive Formulated CVM Tool Steel for unmatched durability. L-keys, Wing Handles, Flag Handles, PowerHandles, T-Handles, MicroFinish, Sockets, Precision Tech Series, Insert Bits, Power Bits, Micro Bits Tamper Resistant, Interchangeable Blades for System 6 &4. 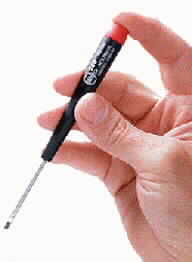 Get The Wiha TORX Advantage. TORX requires no insertion pressure for driving and no cam out forces are generated. TORX has axial power transmission areas, Tools don't slip. Reduces possibility of distorted screws. Wiha TORX has 6 large torque transmission surface areas that allow for higher sustained torque forces. Wiha TORX has 15 degree efficient drive angle Tools and screws won't become distorted. better screw to tool contact. Wiha TORX profile is precision machined for an exact fit and long tool life.